One Hot Lap: A Great 2013 Resolution: Take a Trip to the Tail of the Dragon! 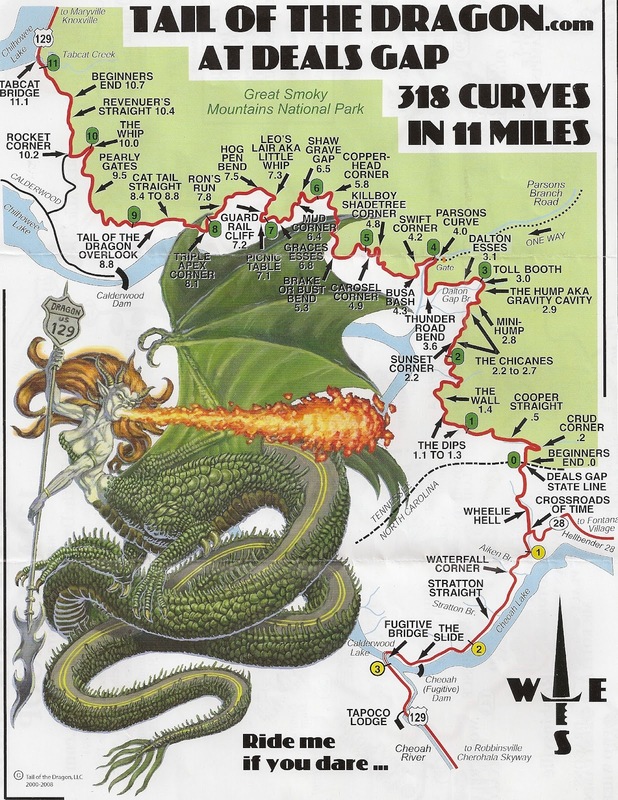 A Great 2013 Resolution: Take a Trip to the Tail of the Dragon! Our average life expectancy is over 30,000 days. If and when I make it that far, I wonder how many days of my life I will truly remember. 10? 20? Maybe 100 tops? How many of these will be the kind of days that you love to think about over and over again? When my whole life flashes in front of me in a brief second, one of the frames in it will be the memory of my trip to the Tail of the Dragon. 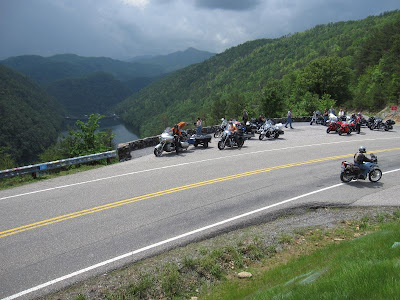 The Tail of the Dragon is a section of Route 129 in the Smokey Mountains at the Tennessee and North Carolina state line. It has 318 curves packed in 11 miles of smooth-as-glass banked pavement. It is unofficially America's number one motorcycle and sports car road and it is as close to the Nurburgring as you can get Stateside. The ‘Ring is also a public road except when it is closed off for testing purposes, training lessons or racing events. The one major differences is that the Tail of the Dragon is a two-way public road and you won’t be going anywhere close to Nurburgring speeds. On the plus side, you don’t have to pay $30 for each lap you drive either. My friend Nicolas and I had scheduled a trip to the BMW Performance Center in South Carolina for the M Performance Driving School and we thought it would be great to extend our trip with a BMW factory visit and a drive to the Tail of the Dragon. The factory visit was fascinating and I highly recommend it. The M School was nothing short of amazing! But even with so much to see and do, the trip to the Dragon will probably leave the most lasting memories for me. For years I read write-ups by enthusiasts who'd driven the Dragon and I was very excited about the opportunity to finally live one of my dreams. We were very lucky to get a brand spanking new Mustang for our car rental. As far as reasonably priced rentals go, it doesn’t get much better than this. Interestingly, only 2 of the 5 or 6 major rental agencies in the area had Mustangs or any other sports cars at all. And they had them in very small numbers, so you could request it in advance but they could not guarantee the same car. Most people still rent cars by the pound and are not ready to pay a premium for sports cars, so most rental companies don’t carry them. The Mustang gets a lot of attention in that part of the country: the bikers pumping gas across from us at our first gas station stop were eager to find out how the new ‘Stang was. I can’t say that a biker’s ever initiated conversation with me on any other occasion in the 10 years that I've owned BMWs so you could say the 'Stang is a much friendlier car! 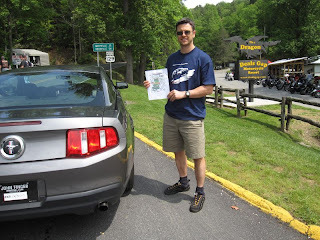 Armed with a Valentine One and two pairs of vigilant eyes in light traffic, we made from Spartanburg, SC it to the Tail of the Dragon in good time. The base camp at the Tail is appropriately named Crossroads of Time. Its parking lot spots are sized for bikes and there were only one or two cars for every 100 bikes parked in the lot. It looked like a breeding ground where the biker species descends upon the crossroads from all parts of the continent to check each other out. No two bikes were the same and most of them cost more money than our new Mustang. Amazingly, some bikes these days have so much storage space, you can bring a grill and barbeque enough food to feed all your friends right in the middle of the parking lot! 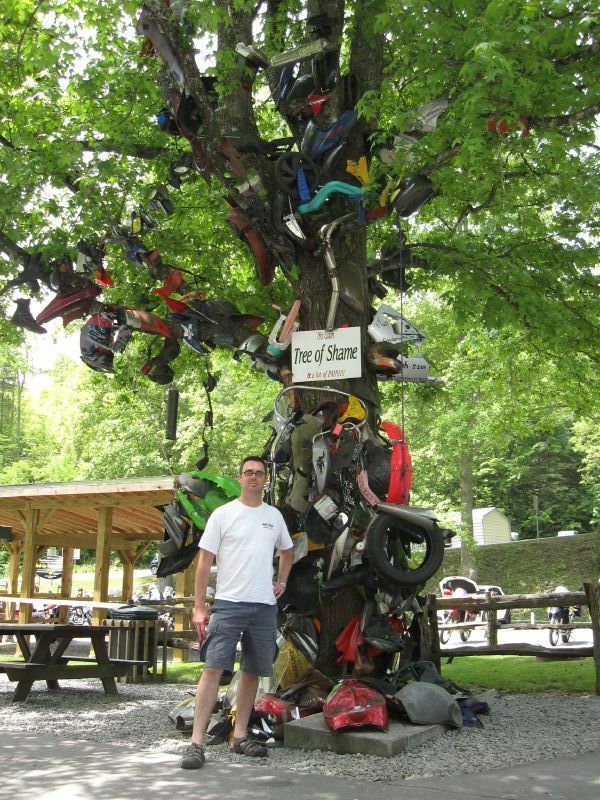 At the far end of the Crossroads of Time stands the main attraction: The Tree of Shame with countless damaged car and bike parts hanging from it. Some drivers scribbled what happened to them right on the vehicle part they left behind. It usually goes something like this: “Hit a bump in the road right in the middle of Parsons Curve, rear stepped out, car dug into the dirt off the road and rolled over…” Understandably, it’s never the driver’s fault! Accidents along the Tail are almost a daily occurrence and there are some 5-8 fatalities each year. A bike had gone off and it was being loaded onto the wrecker just as we were coming back from our first run. Many of the Harleys were not exactly modified with handling in mind: a few were lowered and we saw some scraping their exhausts with sparks flying around when leaning ever so slightly in turns. There were some fairly experienced riders on fast Japanese bikes and Ducatis who tried to look like Moto GP’s Valentino Rossi and they were a lot of fun to watch in the curves. The ‘Stang didn’t have trouble keeping up with any of them. Many of the turns along the Tail are blind, so crossing the median yellow line is considered a serious offence that would require you to see a judge if ticketed on the Tennessee side of the state line. We were very careful not to cross that line and were always on guard for oncoming traffic that might be crossing into our lane. It doesn’t happen often but when someone drives into your lane, you have to be prepared to react quickly. You cannot be close to the limit of the car at that point. I took a stab at the Dragon first and 11 miles went by quickly. Every once in a while we got stuck behind slow bikes whose riders were just happy to cruise along slowly, so we’d pull over and enjoy the vistas, look at some of the oncoming cars and bikes, and give ourselves some room to run before we catch up with the “tourists” again. All this makes you appreciate track days even more: you can go more than twice as fast on a road course at least twice as wide and drive on banked curves just like the Dragon. Best part is, there is no oncoming traffic. At the track, you will also get a safe point-by when you are ready to pass a slower car (there is no passing anywhere along the Dragon). Our GPS apparently thought that we were about to fall off the edge of the earth! Snapping up pictures of bikes and cars is apparently a good business: there were at least 5 or 6 photographers at key turns and we stopped to talk to some of them. We found out they take some 4,000 pictures in half a day and typically post them on their websites by the end of the day. You can find your pictures and buy them in high resolution for a reasonable fee. All you have to do is remember the name of the website that photographers advertise and the approximate time of day you drove the Dragon - the rest is easy. We saw a couple of souped up Subaru STIs, EVOs, another Mustang, a Miata, an RX7, a ‘Vette, a Golf, and an assortment of cars ranging from your grandparents’ Buick to recent model minivans that day. We rested at the Crossroads of Time for a few minutes and my friend Nicolas took a turn at the wheel for his run at the Dragon. It was great to have an opportunity to enjoy riding along the Tail from the passenger seat as well. We stopped at Mile 9 to admire the majestic Chilhowee Lake overlook at Calderwood dam where it seemed as if sky, road, land, water, air, and mountains all come together into one (no Earth, Wind and Fire, though!) The nearby Cherohala Skyway, which cost $100 million and took North Carolina 34 years to build, is said to have great overlooks as well and it is considered a faster version of the Tail of the Dragon. We were tempted to give it a try as well but the weather started turning ominous and we decided to head back for our flights home and avoid spoiling a perfectly good day. 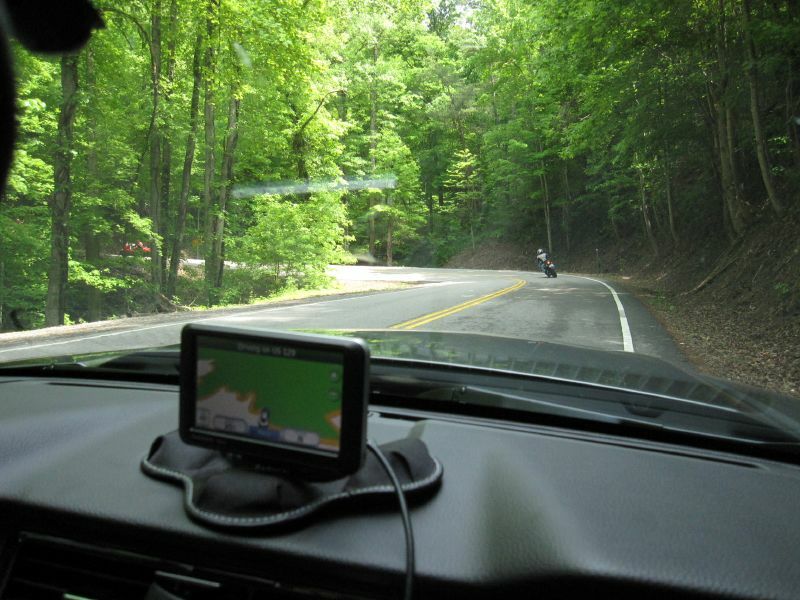 Besides, this way we’d have a good excuse to go back to the Smokey Mountains for some more driving and camaraderie! Now I have to work on making the rest of the 30,000 days of my life as memorable as my trip to the Tail of the Dragon. Come to think of it, I have been through nearly half that number of days already, so I’ll have to get on it right away. Sometimes you have to slow down to go fast - just like any turn leading to a long straightway! That brings back such good memories! Thanks for the write-up. This trip will stay with me forever as one of the coolest things I've done in my life. And couldn't have done it with a better friend. Same here, buddy! The Cherohala Skyway would also be worth going back for.